Myth No. 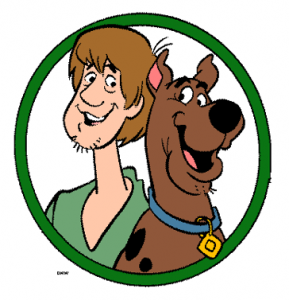 1: The name “Scooby-Doo” was inspired by Frank Sinatra’s recording of “Strangers in the Night” (“…dooby, dooby doo…”), which CBS exec Fred Silverman heard while traveling on an airplane. Myth No. 2: The show’s core characters represent the typical students from five Boston-area colleges: Preppy Fred represents Amherst College; rich kid Daphne, Mt. Holyoke; brainy Velma, Smith College; hippie Shaggy, Hampshire College; and “party animal” Scooby, University of Massachusetts. Verdict: False. “While I hate to affect the regional pride of these Bostonians, I have to say that there is no truth to it,” said Iwao Takamoto, who designed the characters. What the proud people of Beantown seem to recognize is a deliberate plan to give each kid a kind of archetypal universality. Verdict: False. Widespread, but still false. Dozens of arguments could be offered as to why no self-respecting middle-aged Hanna-Barbera artist or writer in 1969 would even think of jeopardizing the success of the show with such a joke, but the easiest refutation is to go to the source. “It’s not true,” Takamoto said. “The creative team never brought that into play in our thinking about this show. It wasn’t until much later that this sort of rumor began to surface.” Besides, Takamoto added, one of the key creative players in the development of Scooby-Doo was a network executive, which means that Silverman would have had to have been in on the joke himself or uncharacteristically unaware.